We know that we live in a very special place here in the Tahoe Truckee area. It is always a pleasure to be able to share our world with visitors. 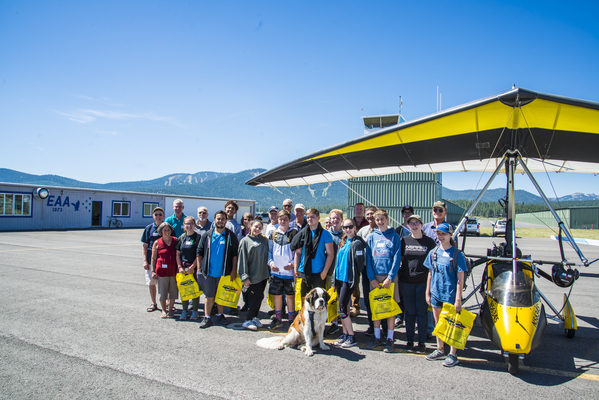 On June 22, 12 young men and women ages 14-18 from Tennessee, New Jersey, Vermont, Nevada, Washington, Pennsylvania, Hawaii and California met at the Truckee Airport’s EAA building for a Young Eagles Scenic Flight over Lake Tahoe, Donner Lake and the Sierra Valley. They saw the world from a perspective most people never experience. Who were these young people? Chris Parkhurst, a retired Marine Colonel and an EAA member for 25 years, is on the Board of Directors of Freedom Hunters. His 501C program helps wounded veterans and their families enjoy the outdoors, making new friends and finding new passions in their lives. They provide 1,500 events annually for the veterans and their families. Gary Farwell, the owner of the Sage Chicken Ranch in Idaho, has offered his ranch as a destination for hunting, fishing and family fun. His son was killed in the war so he truly understands what the veterans need. Gary’s 11 year old grandson was at the ranch visiting his grandfather when Chris was there with the veterans. As veterans do, they reached out and invited the grandson to join them on the hunting trip. He was successful in the hunt! Chris kept in touch with the grandson. He was an Eagle Scout doing well in school It was a shock to hear that the grandson ended his life at age 15. We live in an amazing generous community. QD Construction provided vans and a support truck. NAS from Fallon provided the tent for a dining hall. Nevada National Guard provided tables and chairs. Scheels gave backpacks and Branded Screen printing and embroidery made a Freedom Hunters logo to go on the back packs. FC-13 provided kayaks, paddle boards and canoes. Cashman Equipment Co. provided a generator. Nevada Department of Wildlife also helped. Project Discovery’s ropes course allowed the young men and women to overcome obstacles and bond together as a group. Dustin Cardoza, Kris Buttenberg and Scott Sandy were mountain bike guides on the Flume Trail while Tahoe Light Photography took pictures. Ken Cronin shared his fishing boat. Kevin Stanley took his wakeboard boat to Emerald Bay. 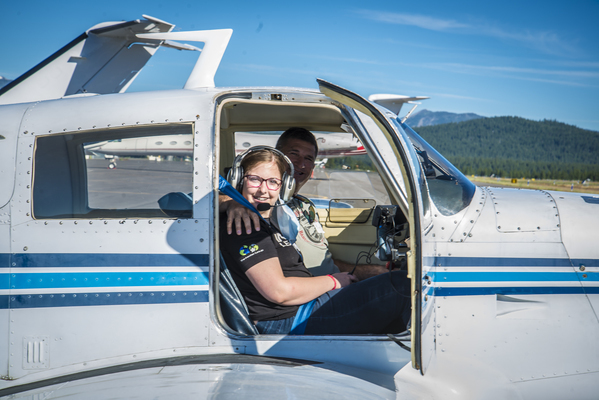 Tom Meadows arranged to have six pilots and their planes for scenic flights. Truckee River rafting Co. gifted floating down the river. Tahoe Art Haus had them enjoy a movie and popcorn. Mo’s Original BBQ just asked when, where and for how many providing an evening meal. Tahoe Sport Fishing went on a five hour fishing trip . spark a passion in these young people’s lives. He hopes that by the end of the camp, the young people will not feel so alone and can support one another in the future. More than 100 people gave their time and donations to make this possible.